Grand Slam is an odd duck, to be sure. He was not featured much in G.I. Joe lore, but for some reason has an amazing fan following. 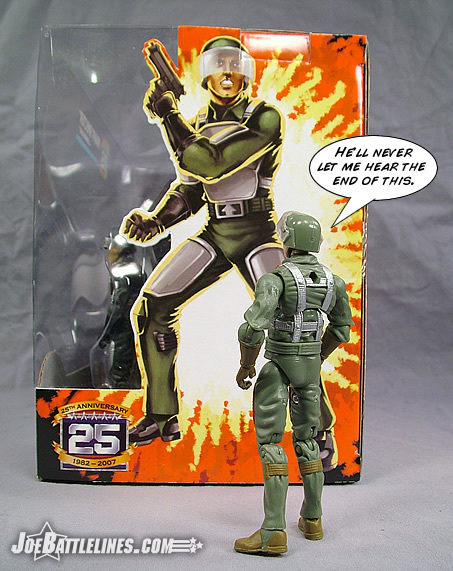 Honestly, besides kicking Major Bludd through the window of a bus, can anyone name one thing that Grand Slam did throughout his twenty-five year tenure of G.I. Joe history? All that aside, he still really resonates with fans and has become a cult favorite. So much so that his Convention exclusive from last year is one of the most valuable Collectors’ Club exclusives we’ve ever seen. 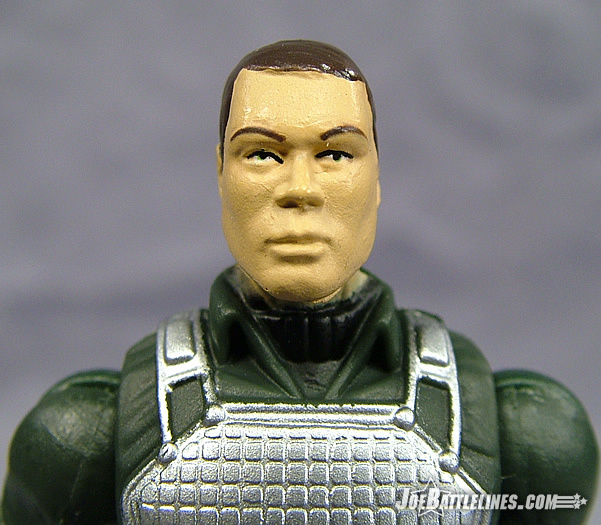 But alas, Fred is right, poor old GS never has had a new head sculpt, nothing really to identify him apart from Grunt, Bazooka, Fred, and now Flash. 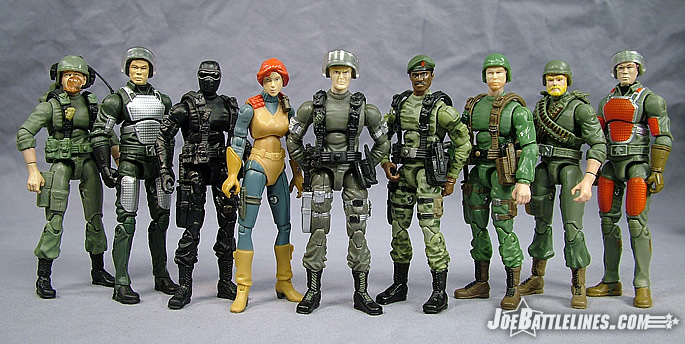 But really that doesn’t bother me a whole lot, especially because both Flash and Grand Slam have their helmets and visors, which do a good job hiding most of their facial features away from collector eyeballs who want to tie them too close together. Yes, Grand Slam is purely a repaint of Flash, just like the original (though the original at least had a different head sculpt…ironically enough it was Grunt’s, and now the 25 th Anniversary Grunt shares his head with Grand Slam AND Flash, so it all ties back together), so this works perfectly. The deep, dark green of his uniform, the black gloves and boots, and the bright silver protective armor are all evocative of his original version and contrast against Flash to perfection. 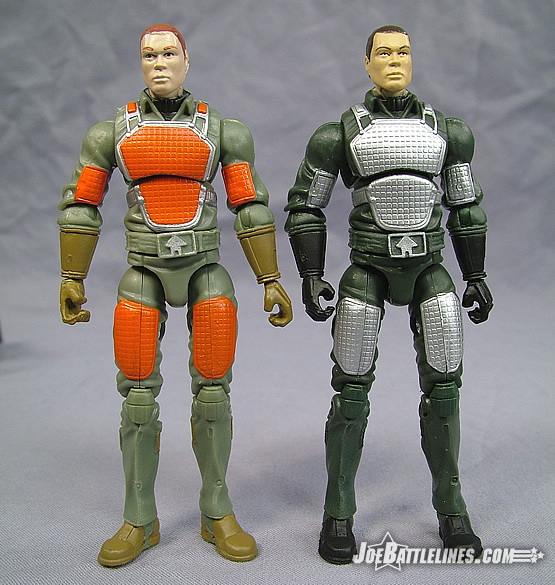 The lack of accessories is unfortunately even more prevalent with Grunt, since he has become so identified with the JUMP jetpack, but I have a feeling we’ll be getting our share of JUMP’s with future figures that Grand Slam can “borrow”. 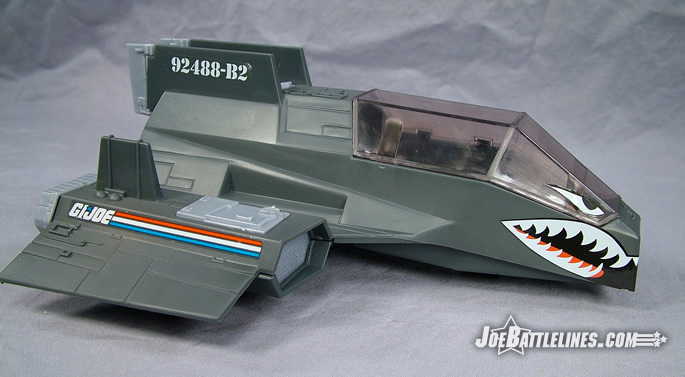 The original SHARC was one of those vehicles that I liked in spite of the completely absurd nature of the concept. I purchased my original at a local discount chain because it was marked down as “missing parts”. Apparently some poor schlub decided to rip the box open and only stole the two Styrofoam inserts that helped the vehicle to float in water. His loss was my gain as the otherwise complete vehicle was marked down to $5.00! Getting back on topic, I’ve been looking forward to this re-release of the SHARC since I first saw pics of it at the 2007 Collector’s Convention in Atlanta. 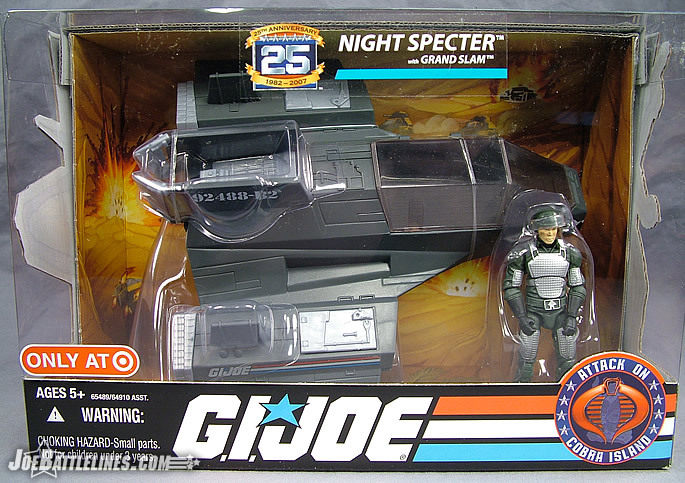 The darker color scheme comprised almost entirely of dark green and gray works extremely well in converting the original vehicle into the stealthier Night Spectre. (I can’t use the American spelling of the word—not after reading all of those Ian Fleming James Bond novels as a kid.) 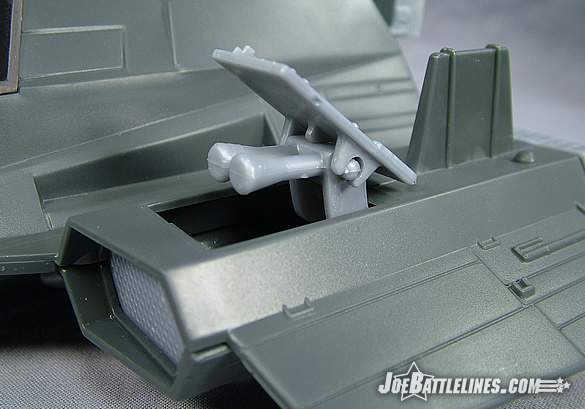 The overall body is a dark olive shade while the engine covers, outtakes, gun parts, torpedoes, and rudders molded in a silver gray plastic. 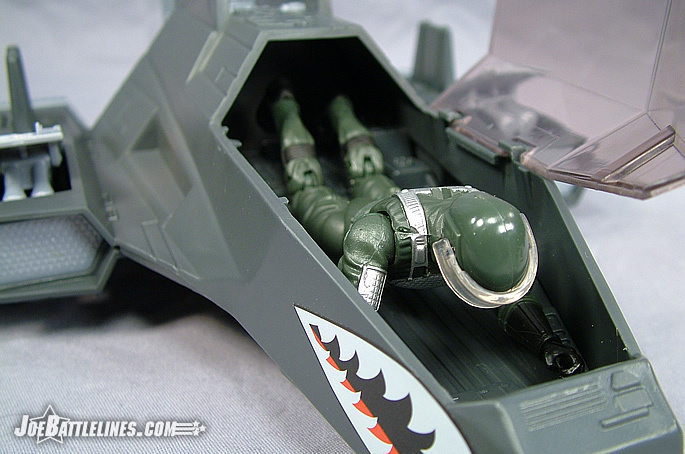 The canopy is molded in a tinted translucent plastic allowing a full view of the pilot’s backside as he/she lies down to pilot the Night Spectre. (Look, the concept is ridiculous—just go with it.) 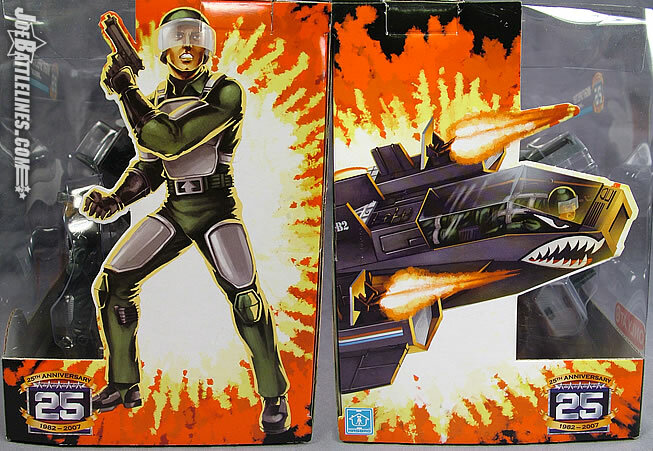 The vehicle, much like the AWE Striker and the HISS Tank is packaged pre-assembled with the decals placed on one side only. I’m uncertain as to whether or not the foam inserts have been included in this version or not and have yet to see if the Night Spectre will float in water. 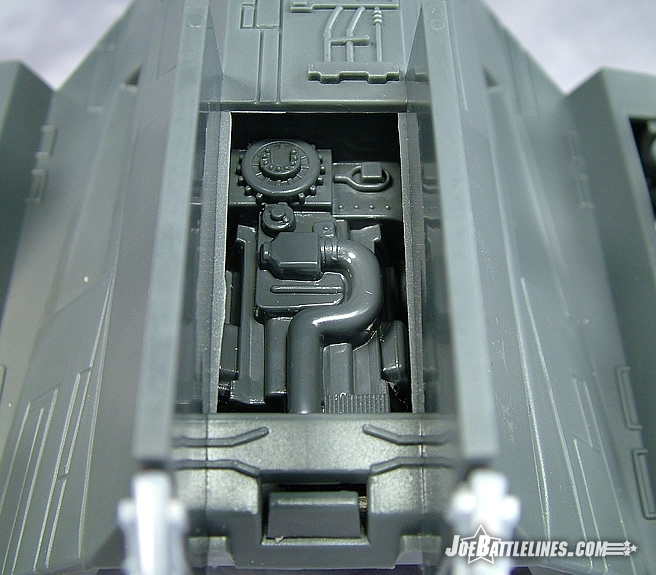 The removable engine cover and pop-up cannon assemblies are still present a tribute to the sheer beauty of the classic ARAH-era design. All-in-all this is a solid update to the classic “flying submarine” of the 80’s—with a new color scheme and name breathing a new life into a proven design. 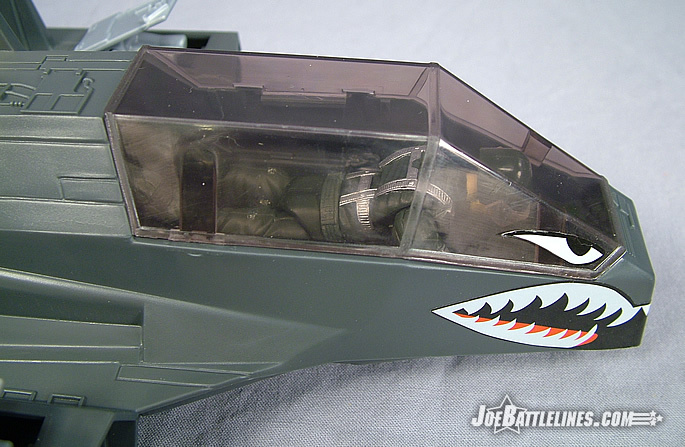 (I even like the shark’s teeth decals!) Anything to add on the plausibility of a flying submarine, Justin? That being said, the SHARC was something that never really appealed to me as a kid or an adult. 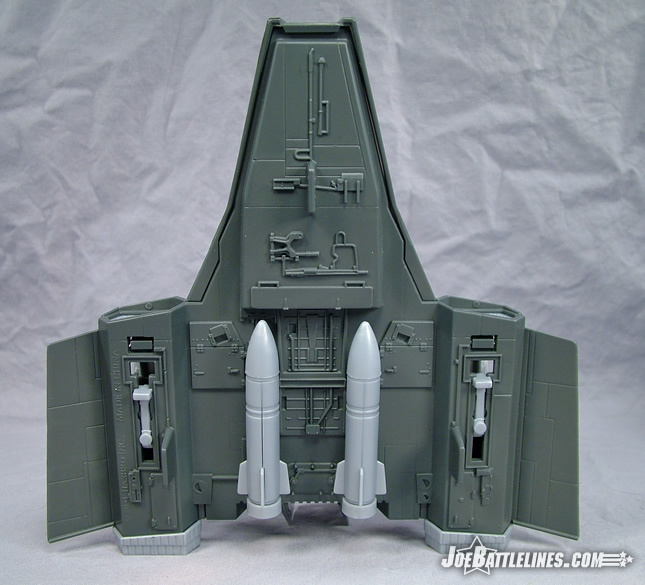 There was plenty of play value to it, with the flip-up wing cannons, the missile ports (that could also hold divers) and the fact that it could be a submarine or a jetcraft. Perhaps it was the overuse of the SHARC’s in the cartoon, but regardless, it was a vehicle that I just didn’t love, and the Night Spectre doesn’t really make me love it any more. All of that aside, for folks that are fans of the SHARC, the Night Spectre delivers in all aspects. It has all of the features and functions of the old school version, but in a much darker steel-gray color scheme which is actually pretty damn nice. I love the “Teeth” decals on the front (along with the eyes), it really adds some life to the vehicle and separates it somewhat from its more boring white older brother. The play action still works remarkably well, with those cool little double-barreled cannons, the opening canopy, and removable torpedoes. It would have been a really cool touch to retool the torpedoes and the bottom pegs of the Night Spectre so an Anniversary figure could fit on it as well, but that would have likely incurred too much expense to make these viable at a $10.00 price point. All told, even though I’m not a huge fan of the SHARC, I can appreciate those folks who dig it, and for people who like it, there’s a whole lot to love with this version, too. It’s a good one. As I said with the AWE Striker and the HISS Tank, the value of these exclusives cannot be disputed. For $10.00, fans of the classic line can own a fantastic update of a popular ARAH vehicle in a slick new deco. Fans of the 25A line can acquire not only an update to one of the “original 13” but also can add a much-needed vehicle to their growing collection of new style figures. Either way this is a “win-win” situation which will hopefully encourage Target to pursue further exclusives in the not-too-distant future. Right now the Anniversary line is hot and I can only see the line’s popularity growing past the label of “anniversary” and into the new designation of “movie”. Let’s face it—unless this movie is “AvP: Requiem” or “Pathfinder” BAD, Joe’s popularity is only going to continue to ascend. As such, this new style of figure is going to require more and more vehicles and accessories—and I doubt any of them will be quite so affordable. Snag this one while you can as I don’t see any of these languishing on shelves for long! Agreed 100%. Fans of G.I. 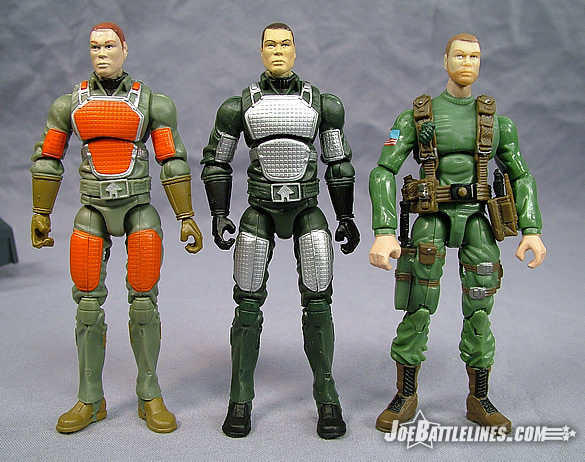 Joe who have been collecting since 2000 will recognize these first three vehicles as being three of the first vehicles we got back then in the “Real American Hero Collection” as well, and there are definitely some similarities. But getting these slightly retooled vehicles and a trio of awesome vehicle drivers (with this Grand Slam leading the pack) is really a no-brainer. You can’t buy vintage ones for that price, and there are some aspects of these that I like even MORE than the vintage versions, so once again, jump on these when you see them. With the price of oil skyrocketing like it is, take advantage of these deals, next year at this time, we may not see prices like this.